Every so often I stumble across a new author whom I feel I should have known about. 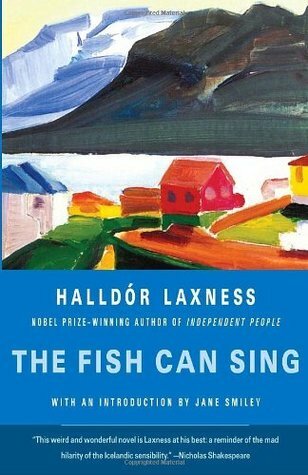 Laxness won the Nobel Prize for Literature in 1955 for "for his vivid epic power which has renewed the great narrative art of Iceland" and his books have been translated into English by author and TV presenter Magnus Magnusson. Alfgrimur, an orphan, grows up in Reykjavik, Iceland at the turn of the 20th century with a couple he calls grandfather and grandmother but who are not. This is a classic bildungsroman type novel about an artist finding his own voice at a time when the old world was on the brink of the modern era. As he grows up Alfgrimur find his once safe and secure small child’s world is changing, just as Iceland is undergoing change, just as fishing is changing from subsistence fishing into mass trawling. The diverse community of people who board with his grandparents represent all strands of a society with a strong oral tradition. Uneducated in the formal tradition, poor in economic terms they nonetheless provide the boy with his education, life skills and moral stance. The book is a gem. It tells a great story deft touches of ironic humour especially made manifest in the character of Gardur Holme the supposedly world renowned, Icelandic opera singer and irony and raises real questions about worth, value, globalisation, greed, self worth and self respect. ashramblings 4* A little gem of a find , I’ve already ordered another of Halldór Laxness’s books, Paradise Reclaimed from the library.